Alpenglow School creates an inspiring learning environment by delivering its teaching through three core pillars: Waldorf pedagogy, academic excellence with the Alberta Curriculum, and Nature Immersion. It’s this last pillar, nature immersion, which is highlighted on this page. 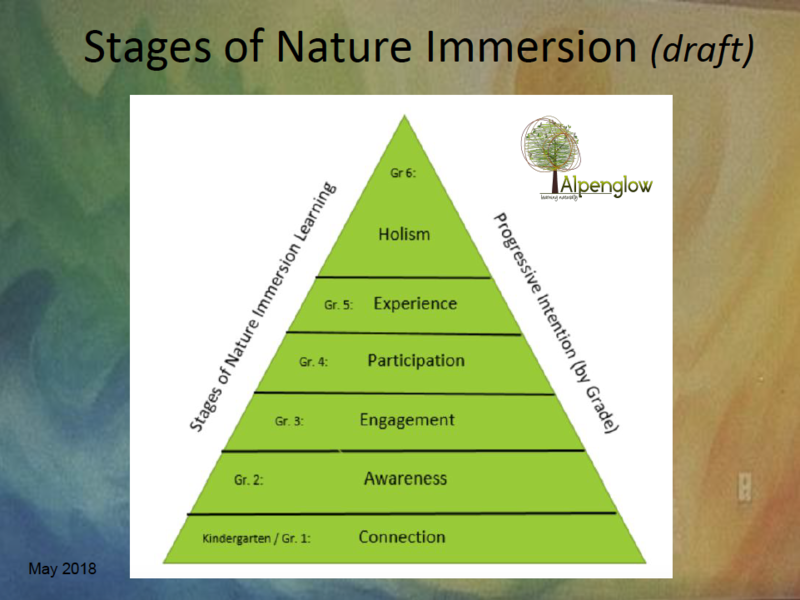 The following images have been created for parents and visitors to better understand how nature immersion teaching is conducted at Alpenglow school. The documents include: the core nature immersion teaching pedagogy (style) utilized by the teachers, the stages (intention) of nature immersion through the years, and lastly, a creative wordle image depicting the value and benefit of outdoor nature immersion. The three teaching pedagogies highlighted in this diagram represent the teaching styles & techniques used by the Alpenglow teachers, which help to ground the practice of teaching outdoors. Each pedagogy is given some additional information and context for clearer understanding. Firstly, the benefits or intended outcomes are shown with the words in italics under each heading. Next, there are principles for each pedagogy, these provide some defining words and add additional context to the teaching pedagogy and lastly, tangible examples are provided to show how the technique has been put into practice at Alpenglow School. 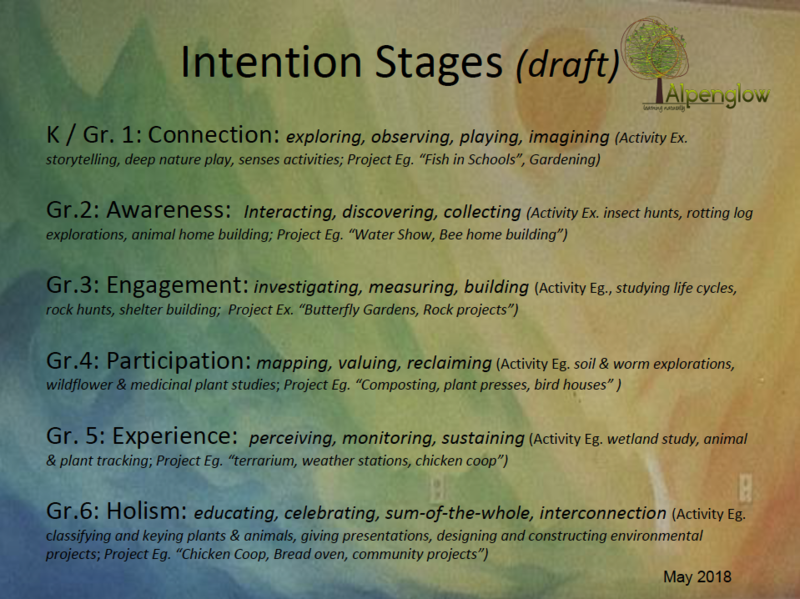 The Stages of Nature Immersion document highlights the overarching nature objective for each of the grades. The focus of this document is to show how the children move through a meaningful and intentional series of activities and projects that will help them connect and build on their time and learning in nature. This helps teachers to consider whether the nature experiences are age and stage appropriate. Examples of both activities and projects have been provided at each grade level. *Please note: these documents are listed as ‘draft’ as they are still working documents being evaluated. This wordle was created after two parent information sessions on nature immersion at Alpenglow school. The words and phrases were captured from the probing question “why do you feel learning in nature is important for your child”. 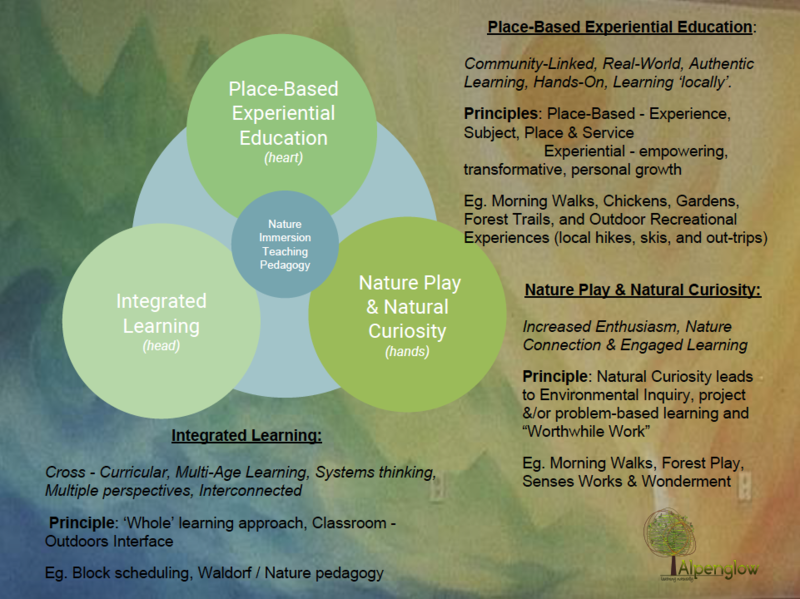 It highlights both the value and benefit parents have for the nature immersion core teaching pillar.